News, news and more news! In fact we spend as much time talking news as we do talking series. 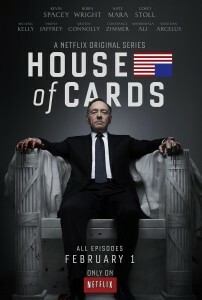 Of course the news is that Netflix’s original series House of Cards was released. Considering how much we talked about it, we could really just say we reviewed it. But this really exemplifies what’s going on in this industry… Is House of Cards a webseries? Or is it a television show released online? Is that the same thing? After having only watched one episode for Nick and three episodes for Candice, we have certainly watched enough to give it a bit of a review since the 55 minute running time of the pilot episode is as long as entire seasons of shows we’ve reviewed, if not longer. Let us know if you’ve watched the show, how you’ve watched it and what you’d call it. And from one big budget show to another, we move on to reviewing Bryan Singer’s well funded experiment in online story-telling, H+ The Digital Series. This one is one of YouTube’s official channels and is in partnership with Warner Digital Distribution. The fact that such big names are putting their money behind narrative, scripted series, available only online is a step in the right direction for all web creators, right? Or is it just another example of big bad Hollywood coming in and taking all the money, all the views and all the awards and leaving nothing for the little guys? That’s not for us to decide, we are only here to tell you whether it’s worth your time to watch it. And on that, we are divided. The series is maybe too long, or maybe the episodes are too short, or maybe Candice has a really short attention span. Either way, this series won Best Cinematography and Best Visual Effects at the 2013 IAWTV awards along with Best Direction and Best Sci-Fi Series at the 3rd Annual Streamy Awards so you know it’s at least gonna look and sound good. We get into a pretty meaty discussion about this show, Guidestones and House of Cards and the episode structure. We’d love to hear what you think about it. Is length of the episode still a guideline for webseries or should the short format be thrown out the window? And, can you believe it, we cover one more thing in this jam packed episode… Steve Silverman’s new webseries The Inn has started. Watch the pilot episode and get hooked. It’s not Pretty the Series, that’s for sure!